KAMPALA, Nov 3 2014 (IPS) - Until last month, Allen Nambozo’s only source of income was the cabbages, carrots and bananas she grew along the slopes of Uganda’s Mount Elgon in the eastern district of Bulambuli. But weeks ago her little vegetable farm was washed away by ongoing rains in the region. And now she’s not sure how she will earn a living. The rains did not only destroy crops. The road network that connects Bulambuli to the neighbouring districts of Mbale and Kapchorwa was washed away. Nambozo, and her neighbours, sell their crop at the local markets in these neighbouring districts. “I have nowhere to grow food. I have to wait for the rain to stop so that I can start afresh,” Nambozo told IPS. Bulambuli is located near the slopes of the fertile Mount Elgon, which is a dormant volcanic mountain. Despite the risks of farming on the Mount Elgon, many of Nambozo’s neighbours have opted to farm on the mountain because of its soil. But district authorities have asked residents to move to safer places fearing that the continuous rains could lead to mudslides and possibly deaths. Currently, about 500 households are in danger if they are not relocated because of the continuous rains, Sam Wamukota, a member of the local disaster committee, told IPS. But many are reluctant because there aren’t adequate facilitates to house them and because they want to remain near their fertile gardens. “Even if we go to the school for shelter, [we will be] without bedding and food. It is useless, I think they should leave [us in] our homes because there we have some items to use instead of suffering in a group,” Nambozo’s husband, Mugonyi, told IPS. Festus Bagoora, a natural resource management specialist at the National Environment Management Authority (NEMA) says efforts by the authority to get people to relocate to safer places have been frustrated by politicians who want to keep voters in their district. 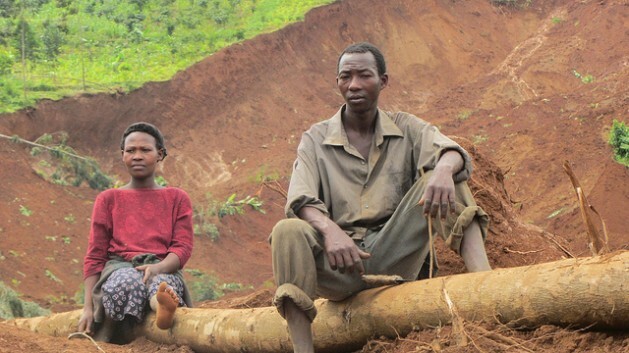 Continuous farming on Mount Elgon and its surrounding areas has lead to the clearing of trees on its slopes. “The vegetation meant to reduce the speed of the runoff from the mountain is has been cleared that is why whenever there is a land slide, especially on Mount Elgon, it is severe because the runoff carries a lot of material, including rocks that are dangerous to the communities,” Bagoora said. He said NEMA has been monitoring the area and has advised the government and communities in the disaster prone areas in vain. He added that this was likely that mudslides would continue because of climate change. Uganda is one of the East African countries likely to experience increased rainfall and droughts in the coming years and proper environment management practices need to be put in place. According to the Intergovernmental Panel on Climate Change (IPCC) Fifth Assessment Report, which was launched in Kampala in September, some parts of Southern and East Africa will experience an increase in average annual rainfall of five to 50mm each decade. Some assessments suggest that wet seasons will be more intense, as is currently the case in Uganda. The report adds that most of the countries experiencing these climate changes lack sufficient data to plan adequately for them. This has been the case in Uganda. And currently, this East African nation does not have the adequate resources to respond to emergencies that come along with a changing climate. Chairman of Bulambuli district, Simon Peter Wananzofu, blames the government for taking too long to respond to the disaster. “We have been pleading with the government to set up a relocation camp so that as we wait for them to [implement] improved infrastructure plans, we are safe somewhere. But they have failed to respond to our plea,” Wananzofu told IPS in a telephone interview. “As I talk to you now, there are two big cracks on the mountain, which have been here for some time. These are likely to affect five sub-counties in Upper Bulambuli. Lower Bulambuli’s road network has been cut off by floods as well. So the situation is getting pathetic,” he said. But the Ministry of Water and Environment, through its climate change policy, has developed guidelines for mainstreaming climate change activities in their budget, according to the ministry’s permanent secretary David Ebong. “Our position is that starting in the 2015/16 budget processes, we want these guidelines to be integrated into the budget cycle so that each sector is compelled to create a budget line item for climate change so collectively we can mobilise resources from all sectors,” Ebong told IPS. According to Ebong, the country still faces a challenge of inadequate finances to tackle climate change issues. He added that climate new was still a new entrant in Uganda’s budget planning processes. “Apart from national financing we must look at other financing options like bilateral financing, financing under United Nations — like the Green Climate Fund, among others — so that there can be other financing options,” he said. The move has been welcomed by environmentalists like Bagoora. “Creating a fund for climate change is a welcome move, the way we react is too inefficient … we should be prepared rather than reacting. When a disaster happens, you start looking for money from left and right instead of acting immediately. And when [there are] money delays, people suffer and the problem increases,” said Bagoora.